Thy life is one of very little ease. I feel terribly lazy writing post after post in diary-like chronicle format, but it’s such a good way to answer the “What the hell just happened?” question. August 1: Home after 90 days at Children’s. August 2-3: Ari has difficult time transitioning from apartment in the city to lake house. Wakes up in his crib on morning of August 2. Stretches and looks around. Looks around again. Yells, “Nurse! Nurse! Where the hell am I?” Erica comes a-runnin’ and all is well. Takes a few days getting used to his new old digs. August 3-8: Cheerful, smiling, enjoying life at home. When nothing bad is happening (foreshadowing!) he’s happy as a clam in high water, ostensibly protected from the sharp bailiffs of the briny sea. We’re weaning methadone every other day according to a very specific schedule. We wean one narcotic at a time. First is methadone, next is Ativan, and after that is Clonidine. Will take well more than a month to get off of them all. August 9: Appointment with gastroenterologist. Ari is gaining weight at home, but at three toed sloth pace. Better than weight loss, but not fast enough gain by any measure. As well, he’s taking some milk by mouth, 10 to 50 ml per meal. The rest gets tubed. We increase is food volume and thus his caloric intake every day and hope he tolerates it and gains. We schedule getting a PEG tube for late August, early September. Why? He’s not eating enough by mouth, and after a while, the NG tube becomes impractical. Irritates his skin. Must be re-taped every day (which is 5 minutes of band-aid style ripping trauma for him and us) or he’ll pull it out (which is a missed meal and an ER visit). Impractical. August 10: Appointment with Wayne in cardiac clinic. Mind you, we have had two outpatient clinic visits so far with Ari, and he’s been admitted to the hospital each time. Every time we try to get out, they pull us back in! This time, we made it home…for a bit. (Wicked obvious foreshadowing!) We didn’t echo because he looked so good, and his chest X-ray looked better than when he left 10 days earlier. 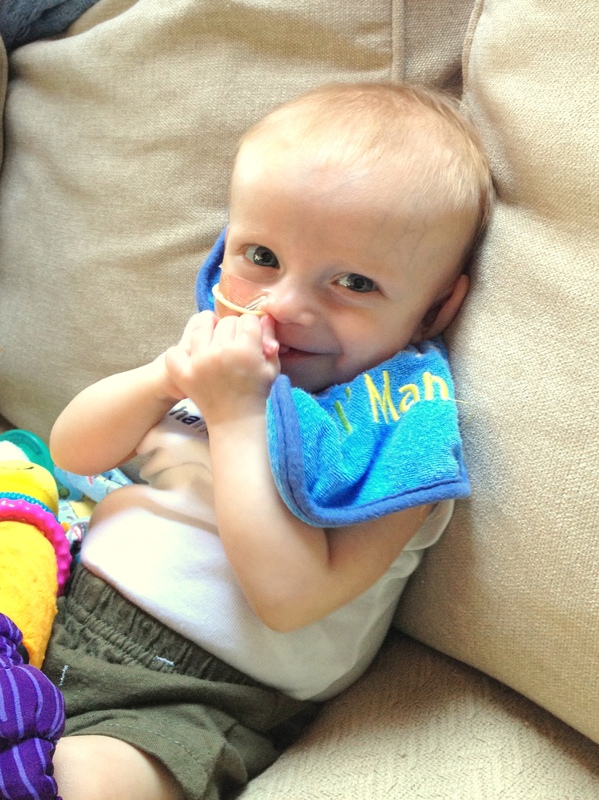 His lungs are now almost normal, and his heart has shrunk. Both good. Next step was to echo when he is sedated for the PEG tube placement just for a looksee and doublechecksee. Ari = all smiles all day. Clam. Ari throws up. First time since being home. Needs to be held all day. Consolable and sleeping intermittently, but getting a little worse. Today we are fairly confident Ari has been having methadone withdrawal. Tremors, sweating, irritable, trouble sleeping, incessant sucking, yawning, 1 vomit 1 spit up, and needs to be held. Next dose is in 1.5 hours. He’s sleeping in Erica’s arms so we’re confident we’ll make it until the normal dose time with Ari somewhat comfortable, but we have an issue we need your help with. Our methadone prescription came in a dozens of pre-drawn syringes according to the wean schedule. We do not have enough methadone to “hold steady” for an extra day. If tomorrow is like today, we would like to follow your instructions and do that. As of now, we wouldn’t be able to. I believe the methadone may have been drawn at the PHARMACY NAME WITHHELD without the precision that seems to be important with this kind of wean. See the pictures attached. 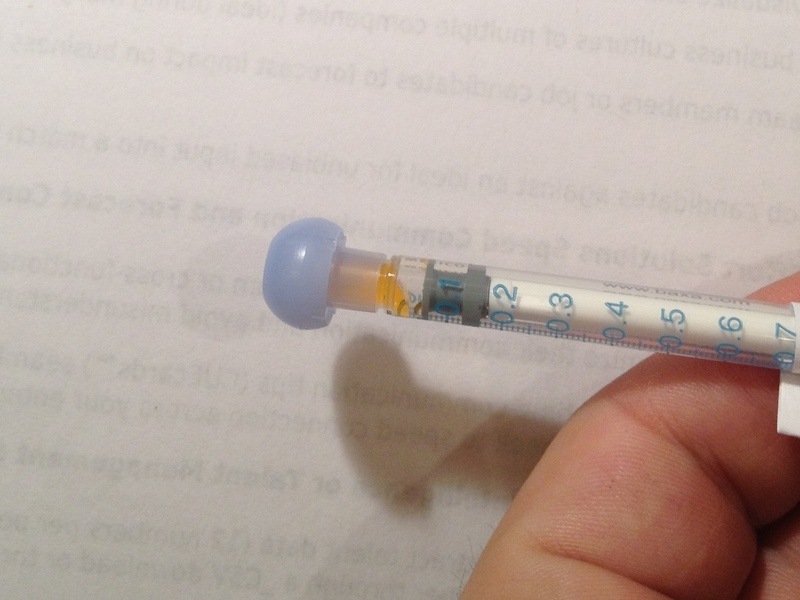 One picture is of the 0.2 ML dose for today. You can see it’s about 25% air. We were taught to flick the air to the top of the syringe and then push it out when we draw medication to have a precise dose. This seems not to have been done so it looks like the dosing is off.In days previous this wasn’t much of an issue as it was a smaller percent of the dose being air. But as the doses get smaller, there’s a larger ratio of air, so the dosing is increasingly incorrect.Because of this, I took a look at the 0.05 ML doses that come in the last days. As you can see, the one I grabbed is 50% to 75% air. If we learned to use the syringes properly (and I think we did), it seems the later doses will be way off. No emergency for tonight, and Ari is comfortable in Erica’s arms, but I believe we will need to solve this tomorrow and get medication redrawn properly. Also, we plan to move the PEG tube surgery up to this Friday – three weeks earlier than planned. Now we get into the hospital mid-week to prepare for that, give him a serious review for withdrawal issues, and move the echo sooner. Night: Sleeps mostly OK. Almost normal up and down. Throws up. Cranky. Withdrawal continues, but maybe a little less. A few smiles here and there. A few good naps here and there (for him, not us). We talk a lot about our instructions for managing the wean process: you’re likely to see some withdrawal symptoms. Wait them out if Ari is consolable, and get to the next dose and they should subside. Over time he’ll get used to the dose and smooth out, and then you start weaning again. If he’s inconsolable for extended periods, call for help or come to the ER. It’s 24/7 work, but he’s consolable, and we have talked to our cardiologist and nurse practitioner multiple times throughout the day. We solve methadone dosing issues. Erica up all night holding Ari. Sleeps a little in her arms and in the swing here and there, but can’t be put down in crib. I take over in a.m.
7:30 p.m. Must be held and walked to stay calm (but not clam!). Erica and I take shifts. 9:30 p.m. Erica goes to sleep, I walk, rock, feed, medicate, and read 19th century sonnets with Ari until 11:30. I get him in his swing and he naps for a bit. I go to sleep. 11:40 p.m. Ari cries. Erica goes to work until 2:00 a.m.
2:00 a.m. I take over. Nothing is working. Not even Cyndi Lauper. No true colors shining through. 3:30 a.m. I go see Erica. ACTION STATIONS! ACTION STATIONS! SET CONDITION ONE THROUGHOUT THE SHIP. THIS IS NOT A DRILL. We start for the ER. Ari throws up so hard his tube pushes out of his nose. Eyes bugging out of his head. We grab his stuff. Meds. Food. 4:47 Driving. Ari calms down. Falls asleep. We call 8 East and talk to the cardiology fellow on the floor. He knows Ari very well, and calls down to the ER to give the attending physician the heads up. 5:05 Ari wakes up all smiles. You little bugger! 5:08 Throws up. Inconsolable. By the way, inconsolable is not just crying nonstop. There are degrees. He’s had a stomach ache in the past that caused nonstop crying. It was like this when he was inconsolable but we stayed home. You know the part of any movie we’ve all seen at some time in our lives where the guy tries to get off heroine? He’s locked in a padded room with a straight jacket on. Screaming with great vengeance and furious anger. Unbridled suffering. Put this in a 9.5 pound package, and you have our little “not so happy as a” clam. Far from friends and they family to roam; Forced, like a Hessian, from thy native home. Emergency room attending physician evaluates Ari. “He looks like hell.” Nice job. Gets history. Pages Wayne. Pages cardiology fellows. 3 fellows come down from the 8th floor to see Ari. They all know him quite well. They work with the attending to get a plan together to recapture him on methadone (if this is, indeed, the issue), and get a quick battlefield echo to check cardiac function and his mitral valve. Note that the last time he looked like this, we thought it was withdrawal. Then we checked his heart via echo. Function looked bad, and his mitral valve stenosis gradient was an “8”. 8, we learned, is the typical line indicating surgery. 9:15 a.m. 1st rescue does of methadone. Not settling out. Hot and sweaty. Reluctant to give him more methadone until we check his heart function. If it’s cardiac function and not wean related, you can get into trouble with too much narcotics. 9:30: NG tube put back in. Chest x-ray to check placement, and look at heart size and lungs. X-ray looks good all around. Same as in clinic 5 days earlier. 10:55: Quick echo. Cardiac function looks good, but his mitral stenosis is reading…wait for it…wait for it: 8. But cardiac function looked good, so that was one hurdle jumped on the path to more methadone if he needed it. Question #1: 8 South (CICU) or 8 East (the floor)? Fellow was on the fence, but opted for 8 East as the bed was ready, the attendings could care for him from either place, and we wanted to see if he’d settle out. Question #2: Withdrawal or deteriorating cardiac function? Withdrawal was still in the lead, but cardiac issues gaining fast. 11:30: 8 East. On the monitor, his heart rate is 190s to 210s. Not good. Inconsolable. Back and forth. Move to 8 South? His heart rate would drop a little. We wait. He’d bounce back up. We watch the monitors and try to sooth him. Move 8 South evaluated again. Heart rate drops a little. We stay. 1:00 p.m. 2nd rescue dose – this one bigger – of methadone on board. He starts to settle out. Heart rate 170s (still very high), and looks like he might fall asleep. I fall asleep in room at 1:30. 3:30 p.m. I wake up and look at the monitor. He’s asleep with a heart rate of 106. Doubletake. 106? No way. What happened? We talk. He settled out. Erica says Wayne called the attending on the floor. He looked at the images and told her he doesn’t believe it’s cardiac related. You’ve all seen pictures of his new mitral valve. It’s big and weird and wacky, so it doesn’t read like native valve on echo. And, again, it was a war zone echo. Not exactly ideal. Sit tight for now. I take a walk and lose it in the hall. Go back in and we sit for a few hours. 6:20 p.m. Wayne comes. Tells us the valve is wide open and functioning properly. Until proven otherwise, your son is a drug addict and too skinny, and that’s all we have to deal with. Assuming he stays settled out, PEG tube surgery still on for Friday. Echo then when he’s under anesthesia just to looksee and doublechecksee, but we expect to see heart looking OK-ish like usual, and get back to weaning and fattening him up. Since then… He’s settled out, but not exactly clamlike. He needs to be held and is cracking some smiles, but he’s just been through a war and he looks it. Probably needs a few days just to recover, but for now the battle is over. Until, you know, surgery on Friday, but this one we’re happy to have as it’s a path to growth, which is his next big hurdle along with getting off the smack. Nurses and doctors required us to go home at bedtime as I had been up for 48 hours and Erica had been up for closer to 72. But trust me, it was tougher on Ari. Declares O clam! thy case is shocking hard! He’s been through so much, and borne it all with grace. For a kid that has just too many cards stacked against him – with too little reserve and many more hills to climb – he finds a way to keep soldering on. Today: Back on the horse. Ari, you can do it! The first step is admitting you have a problem. I’m in the balcony with all of your other friends, family and fans singing and praying and echoing hope. Praying for healing & strength (both physical and emotional) for all of you. I keep Ari in my prayers everyday and wonder what God has in store for all of you. Your Love for your son is evident and strong and I very much appreciate you sharing your lives with us. May God bless you with a another miracle. Ari is the first miracle, having such wonderful parents, is the second and I pray for the third, Ari’s to be well. You are truly amazing–all 3 of you. I do believe we summon the strength we need to make it through challenging times but the strength and courage you have shown is beyond that which I have seen before (educator & clinical social worker 20+ years). You have more personal strength and fortitude than many people will ever know exists; yet, I feel for you and the pain you are enduring. Keep up the fight! That high five is worth it! You are all soldering on with amazing grace, humor and love! My thoughts and prayers are with you!! Kol Ha-Kavod, Ari! Love to you all as you soldier on. We are all out here thinking of you. Our thoughts and prayers are with you and your family. Your son is a great fighter. Ari has the best parents in the world. Prayers and Love on the way to you and your little one. I can’t conceive of the kind of hell you’re all going through. My most fervent wish for you all is that some day, when you are all well-rested and a little overweight, you will look back on this time with gratitude for the amazing human beings who have helped you and for the amazing human beings this time has made of you all. Ari and his parents are the strongest people I have ever not met! You will be blessed soon, I can just feel it. Hang in there Ari, you will make it. You guys have gone through so much in such a short period of time! I will most definitely keep you in my thoughts and continue to pray that little Ari gets off those narcotics soon and that his heart continues to work the way it’s suppose too! Y’all are the amazing parents of an amazing little boy! God Bless you all!!!! Keeping you all in my thoughts….I can’t imagine the fear….glad to hear he’s just an addict (that’s a weird sentence esp. for a substance abuse nurse)…..may he kick those drugs and become big, fat, and happy…..sending loads of kisses and hugs your way…hope you’re able to get some sleep…the PEG tube is much more comfortable and easy to work with than the NG tube…Ari will be more comfortable…..mwaa!! You are so devoted to your son’s care. We all know how much this situation must be taking out of you……….but it also sounds like Ari gives you so much…….and it’s so worth it. Our prayers are with you all for some peace and stability through this situation. here’s to your soon-to-be-fat little boy! Ari, I’m sorry that you are back here so soon. Wishing you a quick healing and some rest for your parents. You Adorable little clam, you. Oh sweet Ari, this is so much to endure. My heart goes out to you and your Mom and Dad because this sounds so exhausting on the emotional and physical level. You keep telling everyone how you feel and everyone will do their best to help you through it. Mike and Erica, ugh…I really feel for you both and especially Ari. He’s had some huge interventions to heal from and I hope time will be healing on his body. Take it a moment at a time if you need to. I hope the sticky, “band-aid ripping off” type procedures are behind you at home. But, you will likely be taping the g-tube as well and you could try using a alcohol wipe to loosen up the adhesive, just get a little corner free and rub the alcohol wipe under it. Sending my love, prayers, and a lot of hope! Oh my. I can usually find at least one funny-ish thing to write to hopefully give y’all a chuckle but this post made me cry. We haven’t been through anything as scary as y’all have (continually been experiencing for going on 5 months) but this post brought back so vividly that gripping fear and uncertainty that comes with these babies. The feeling that somehow if you stare long and hard enough at the monitor you can will the O2 to stay at 100, the respiratory rate to stay low and the heart rate to stay in the 130s. Your exhaustion is palpable in these words but (thanks be to God!) so is your determination, dedication and love. I wish we lived closer so we could take a shift sitting bedside with your tiny hero. Of course, we all know you wouldn’t leave because you’re keeping those monitors in check. Prayers that the sleep you get will feel like 10 times what it really is. And always, prayers for that smiling little clam. Your wonderful beautiful parents and if Ari could talk he would tell you so…keep the fight! My sister and brother in law went thru similar situation…prayers with you each day! A big abrazo for you three! We´re praying for Super-Ari, Erica and you from Monterrey. Marilu and Alberto. So, so, so glad this doesn’t seem to be heart related. Hate, hate, hate you got a 6 month old addict. Much love, prayers and hugs to you, Erica and of course the star, Ari. You and Erica are doing GREAT!!! Tought breaks but you’re handeling them GREAT!!! Big hugs all around!! Tell Ari that JW says to hang in there and get his fill of pretty nurses b/c poor JW doesn’t get to see many pretty nurses anymore, thank God!! And JW says he doesn’t want Ari to see any nurses for awhile after this either!!! Thank you Mike for the heart rendering blow by blow description of the past few days. Poor little guy, he doesnt’ deserve this…….and you and Mommy are doing an incredible job. Your love for Ari transcends his pain…..and it always will. Grampa and I love you all and are praying for continued strength to endure this trial. xxxxxxxxxto the tens. I’m so sorry for all that y’all are going through. I hope that you both got some rest, I’m sure if you could sleep it felt like a little slice of heaven. I’m praying that Ari also gets rest and recovers from this terrible war that he is going through. My thoughts and prayers are with you all. You all show such great strength. Thinking of you.